Tender strips of real Clam packed in a crunchy coating. Dunk ’em in your favorite dips, stuff ’em in a clam roll or eat ’em on their own. Our Crunchy Breaded Clams are the perfect finger food no matter how they’re prepared. Trust us, your tastebuds will thank you later. UNCOOKED. KEEP FROZEN UNTIL READY TO COOK. MICROWAVING IS NOT RECOMMENDED. 1. Move oven rack to middle of oven. 2. Heat oven to 425°F. 3. Arrange uncooked clams in a shallow metal baking pan, leaving space between clams. 4. Bake uncovered for 12-14 minutes* until coating is golden brown and crunchy. *Fully cooked clams must reach an internal temperature of 165°F or higher. 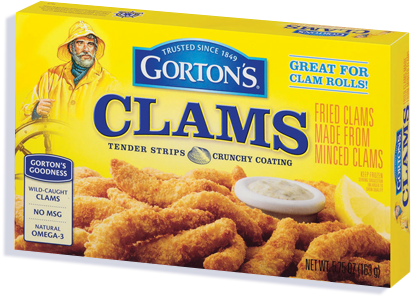 Gorton's Crunchy Breaded Clams are made using sustainably sourced ocean clams harvested off the US and Canadian east coasts. Clams typically range in color from creamy white to a reddish/orange therefore you may see that Gorton’s Crunchy Clams may have some naturally occurring red flecks of clam meat. 1. Fry in hot oil (350 °F -400 °F) for 45 seconds. MINCED CLAMS, BLEACHED WHEAT FLOUR, VEGETABLE OIL (COTTONSEED, SOYBEAN, AND/OR CANOLA), WATER, MODIFIED CORN STARCH, LESS THAN 2% OF: SUGAR, SALT, BAKING POWDER (BAKING SODA, SODIUM ALUMINUM PHOSPHATE), HYDROXYPROPYL METHYLCELLULOSE, METHYLCELLULOSE, YEAST, MALTODEXTRIN, YELLOW CORN FLOUR, WHEY, PALM OIL, EGGS, NATURAL FLAVOR, NONFAT MILK, SODIUM TRIPOLYPHOSPHATE (TO RETAIN MOISTURE), TBHQ (TO PROTECT FLAVOR). CONTAINS: CLAMS, WHEAT, MILK, EGG. Not a significant source of sugars, vitamin A and vitamin C.
30 mg of EPA and DHA Omega-3 fatty acids per serving.